Most farmers depend on rainwater for farming; depleting groundwater has exacerbated the matters. Image: Monsoon 2015 marks a period when India suffered back-to-back droughts, a phenomenon which had happened only four times in the past 100 years. Farmers across India are faced with a multitude of problems, posing a serious challenge to the country's development narrative. Cotton and basmati rice growers in Punjab, sugarcane farmers in west Uttar Pradesh are all under stress due to the non-payment of insurance and state compensation. 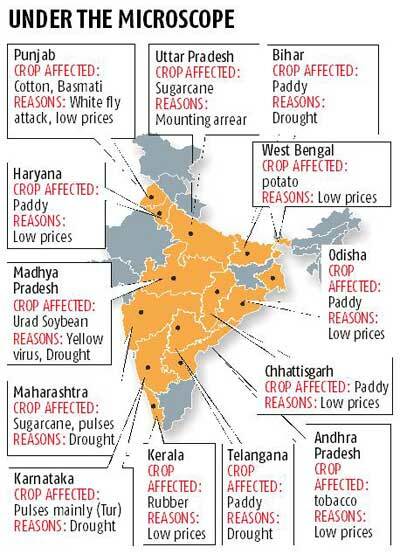 Growers in Odisha, Madhya Pradesh, Bihar and Maharashtra are also hit by consecutive monsoon failures. When Vidisha in Madhya Pradesh (MP) received good rainfall during the early days of monsoon season, thousands of soybean farmers were overjoyed as this was the best in the past two years. They dreamt of a good income and plan for family weddings and better schools for their children. They were happy to see a bumper crop standing in their fields. This proved short-lived as the cumulative rainfall turned out to be below average, making it a second consecutive year of drought. In MP, the soya crop had ripened but the pods were without seeds, making it worthless. Worse, a yellow virus attacked the white lentil (urad) for the first time and destroyed the second Kharif crop (sown between July and October). District magistrate M B Ojha blames "irregular rainfalls" and "rise in the temperature in August" for the reduced yield of soybean and white lentils in the district, which is currently represented by external affairs minister Sushma Swaraj in Parliament and is the hometown of state chief minister Shivraj Singh Chouhan. Unofficial reports suggest the loss of 14 lives either due to cardiac arrest or suicide in this one district. The situation is not much different elsewhere in the state - and indeed in much of the country. The state government has declared drought conditions in 40 out of 51 districts and sought Rs 10,000 crore (Rs 100 billion) in Central assistance. 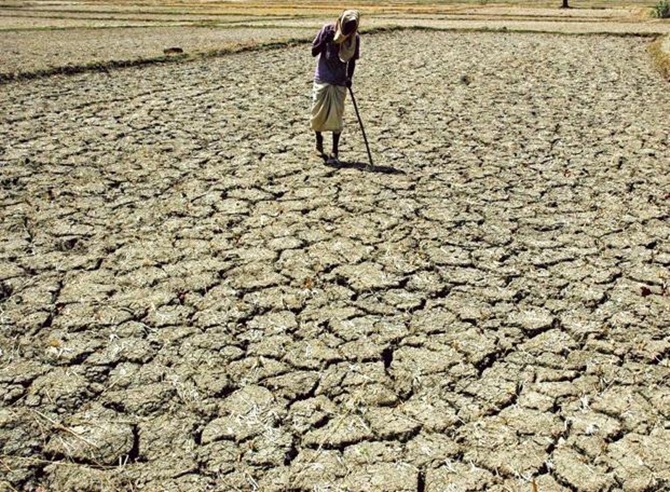 Officials from the drought-affected states will meet the Central government in New Delhi on Tuesday to seek help. "Some states are reluctant to declare the crisis as a natural disaster and are delaying sending the memorandums, which is impacting the farmers," a senior agriculture ministry official remarked. Agriculture growth in 2014-15 was 0.2 per cent, while growth in 2015-16 is also not expected to improve by much and might in fact see agriculture contract. India's average annual farm growth in the 12th Plan period (2012-13 to 2016-17) is set to be far below the targeted four per cent. "A farmer can deal with any problem, but he cannot fight the odds of farming," says Babloo Yadav in Pipariya village between the hilly landscape dividing the Vidisha and Raisen districts. Yadav has sold most of his land to pay the banks and private money lenders. Other villagers also want to sell their land, but say traders are refusing to buy land at even discounted rates. "Even they understand the topographical and monsoon limitations," says Jai Ram Lodhi of Patha village in Sagar district. Some villagers have run away from their houses to avoid the private money lenders threatening to sell their mortgaged lands. In Madhya Pradesh, most farmers depend on rainwater for farming. Shortage of electricity supply, and dipping of ground levels of water have exacerbated the matters for farmers, who are finding it difficult to irrigate the land for Rabi crops. When the rains fail, they are entitled to small amounts of compensation from insurance and aid from state governments, but usually with a lag of a year. The compensation of this year's crop failures of soybean and white lentils will be paid by next year. The delays, according to the state administration, are mainly because of the banks, which fail to deposit the premium on time to the insurance companies. The banks deduct the insurance premium amount before handing out loans to farmers for certain crops. Ojha suggests registering criminal cases against the guilty banks. "No one knows how the insurance companies decide the compensation amount. If the premium is paid for Rs 1 lakh, then why do they give compensation even less than the premium amount?" he says. The insurance companies decide the compensation amount based on the field survey reports prepared by the village revenue officers. Drought has hit almost half the 600 districts in the country and as many as 18 states are in its grip. Monsoon 2015 marks a period when India suffered back-to-back droughts, a phenomenon which had happened only four times in the past 100 years. The severity and spread of the drought has forced many experts to point at climate change as one cause for warmer temperatures for many months that allowed, say, the whitefly to flourish. The Centre had announced a slew of measures to deal with the crisis, which includes a subsidy on diesel, increasing the mandays under the national rural employment scheme, subsidy on seeds, horticulture crops and fodder. S Mahendra Dev, director of Indira Gandhi Institute of Development Research, says India's rural growth story has come to end in the past two years. The Centre, along with the states, needs a new vision on agriculture and not just short- and medium-term measures.